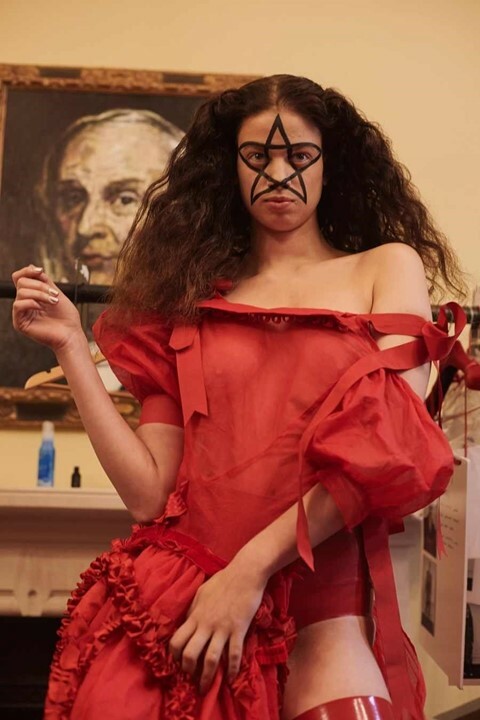 We were enamoured with Dilara Findikoglu's first ever London Fashion Week presentation, a red-hot show which took place in the belly of a church in Holborn, London. It was packed with Satanic and occult references, and featured goth queen and tattoo artist Grace Neutral, rapper Brooke Candy andd RuPaul’s Drag Race season seven winner, Violet Chachki. However, not everyone was best pleased with the 26-year-old Turkish designer's choice of location, with some of her themes standing in direct opposition to the church, which has naturally been opposed to Satanic symbols for centuries. On a recent episode of the alt-right show InfoWars, host Alex Jones went on a rant on what he dubbed an “Illuminati-Themed Fashion Show Held At London Catholic Church” – not technically true as the venue was in fact an Anglican church. Well, wow. That's a bit of a leap, innit? Findikoglu, a Central St Martins graduate, told Dazed that she wasn't expecting the controversy, and has been recieving hate mail and abuse from Christians. “A lot of brands use similar symbols as I do, but I think my whole theatrical hair and make up made people think that it was a Satanic ritual. Actually all the church people really liked the show and thought it was very beautiful. “They personally came and thanked me at the end of the show. The show I did has no religious, Illuminati, secret society meanings... All the symbols I used were for positive purposes. I am a creative and I am not trying to offend anyone. I understand people can be sensitive, but I think all these hate email and attacks I am getting from Christians show who really is wrong – if there is such a thing as right or wrong. However, it's been reported that the church themselves were unhappy with the nature of the show, and have issued an apology for booking Findikoglu's catwalk debut. A spokesperson for the Diocese of London released a statement to Christian media organisation Premier which read: "The parish of St Andrew's has always supported London Fashion Week.